Wire Guide Polyurethane Rollers are one of the numerous custom industrial products that we manufacture at Plan Tech. We manufacture all of our wire guide rollers from high-performance prepolymers with high standards which in turn reduce downtime and replacement costs. Plan Tech has over 30 years of specializing in the manufacturing of precision cut urethane wire guide rollers for a wide range of industries and applications. We utilize the tough characteristic nature of urethane which outperforms plastic, rubber, and steel in its capacity to resist harsh environmental factors such as abrasion, corrosion, heat or high temperature, oil, grease, solvent, acid and several other harsh chemicals. Urethane has excellent resistance to cracking when under repeated flex and wear. These diverse properties of polyurethane enable us to manufacture precision cut wire guide polyurethane rollers that do not just meet international standards but also the specification of our clients. 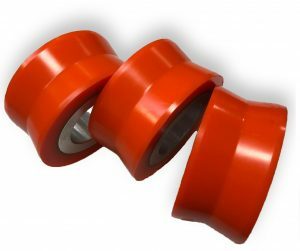 Are you interested in cast Wire Guide Polyurethane Rollers? Please Contact us so we can help solve your requirements and work with you on your specific application!